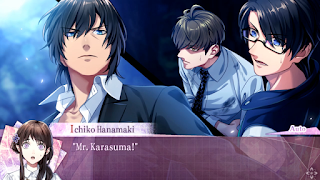 Continuing Aksys' "Summer of Mystery", 7'scarlet has arrived for the PS Vita in the US! This visual novel/interactive fiction takes place in the crescent-shaped country town of Okunezato. Ichiko, the main character, arrives to locate her brother, who disappeared in Okunezato one year ago. Tagging along with her is her childhood friend Hino. While searching, she will meet several other characters that may be friend...or foe. There are plenty of choices during the story, some of which are very important, and a few of which don't affect much. One choice early on was obviously me choosing my route. After finishing that route, I went back and was confused that the other options didn't change the two choices I had. Eventually, I figured out that the first two routes can be done in either order, but the rest are unlocked sequentially. It's an odd choice for sure, but the stories that take place build upon each other, even if they are mostly separate. Happenings in one will become clearer when you play another. Sometimes, there are little details that seem unimportant, but become small revelations when you are involved with another guy. Every route was interesting to me, even if it takes all the playthroughs to actual see the main plot brought to completion. There are a few twists that seem a bit random, but overall I think each route is engaging. As for the length of the story, it felt a little shorter than average. I'd say each route takes about 4 hours to get through. The game makes up for it by having over five routes, most with two different endings. Once I understood how to get each ending, it wasn't that hard to get them, but it did take time to replay each route. There is a standard dialogue skip function to fast-forward through the game. Since the only starting points are the beginning of the game, or the start of each unlocked route, you'll likely need that function to clean up any missed routes. I was spoiled by the flow chart of the previous "Summer of Mystery" game, I know. I really enjoyed the stories in 7'scarlet. While it has some strange differences from other visual novels I have played, the story was very engaging, and I kept wanting to read more. I'd easily recommend it to fans of the genre. Interesting and engaging story that adds more with each route. New game starting points aren't the best when trying to clean up the endings and CG images.